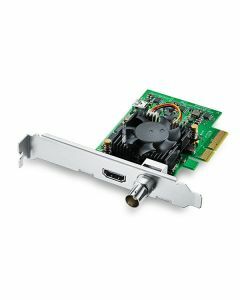 DeckLink Mini Monitor 4K is a low profile PCIe playback card, featuring 6G-SDI and the latest HDMI 2.0a connections so you can monitor all formats up to 2160p30 from your computer. The SDI and HDMI outputs let you connect to any television or monitor and automatically detect and switch between all video formats. You even get high dynamic range playback and metadata over HDMI, along with support for Rec. 2020 colour space. You can even develop your own custom playback solutions using the Blackmagic Desktop Video SDK for Mac OS X, Windows and Linux! Includes two PCIe shields for both full height and low profile slots. SDI Video Output: 1 x 10 bit SD/HD/Ultra HD switchable. SDI Audio Output: 16 channels embedded in SD, HD, Ultra HD. HDMI Video Output: 1 x HDMI 2.0a connector. HDMI Audio Output: 8 Channels embedded in SD, HD, Ultra HD.